Yes it does, the loom looms over the whole room! There, that’s my attempt at poetry for today. 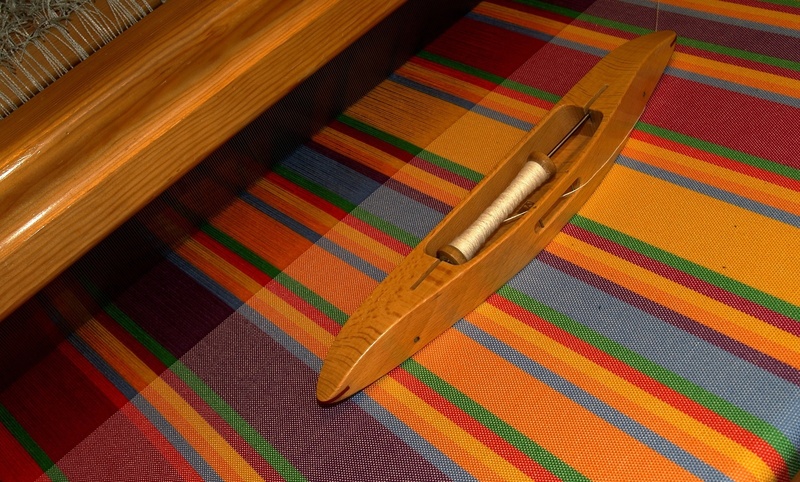 As a kid, I never gave much thought to it, but so many people back home had looms, and wove all kinds of things, (well I assume there were all kinds of things, the only real one that comes to mind now is place mats). Like everything in rural Newfoundland, I am sure it served a much greater purpose than just a craft for enjoyment, our fathers and mothers were more practical, not by choice but by need. But now that I’m older, I sometimes wonder what that purpose was. I know so little about the loom, just how big and complicated it looked, and watching Aunt Vick, amongst others, sliding the shuttles back and forth and pulling the weave tight. But I wonder what did our forefathers use the woven material for? Clothing? Table cloths? Bags? Bed clothes? I really have no idea! I think all our foremothers knit as well, and I’ll write a piece about the old double mitts and vamps soon, but I’m curious now as to the use of the loom! The First Pizza Keepin’ Yer Feets and Hands Warm!